Israel is a high degree. Every person who has separated himself from material interests and is only directed at adhesion with the Creator, with the force of bestowal according to the law of equivalence of form, and devotes every moment to this is called Yashar-El (straight to the Creator), Israel. One of the stages on the path is to enter into a pact, when a person integrates the others, those who are also called Israel, into himself. Once they were already united, but the desire to enjoy, the evil inclination, entered between them and separated them. And now, in spite of the fact that they reveal it, they nonetheless work on their connection all the time in order to reach connection, and to provide the Creator with the vessel for the reception of pleasure. The goal of creation is the delight of the created beings. This is the action on the part of the Creator, so why was it given as the task of creation? Because the creation has to bring itself to such a state to give the Creator an opportunity to bring it pleasure. Our work is to reveal this vessel for receiving pleasure. And the pleasure is to give the Creator an opportunity to bestow. As is it said about the miracle that happened at Mount Sinai: “Today we have all gathered here,” that is, from this point forward we receive the ability to connect and be worthy to be clothed in the upper force. 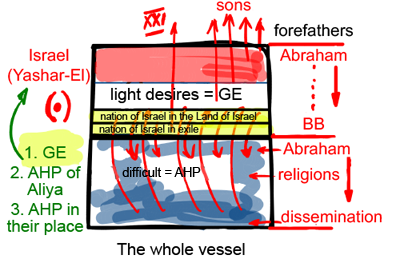 And now we are called the chosen people; this general vessel is called the people of Israel. And He who fills this vessel according to the law of equivalence of form shall be called our Creator. Therefore, there is a condition: “Today we have all gathered here,” that is, we should all get together to become as one—one common vessel for the realization of the goal of creation, to benefit the created beings. It is said: “And the people stood under the mountain,” that is, having broken all doubts (Har – mountain, Irurim – doubts) to achieve unity. We need to take care of our common connection so that none of us forgets about it. Rabash, “Self Love and the Love of the Creator”: There is self love and there is love of the Creator. And there is the transitional phase, which is the love of others, and by the love of others one arrives to the love of the Creator. This is why Rabi Akiva said: “Love thy friend as thyself; this is the great rule of the Torah.” And as Hillel said to the convert who asked him, “Teach me the whole Torah while I stand on one foot.” And he said to him, “Don’t do unto your friend what is hateful to you. The rest is commentary.” Since by the love of others one comes to the love of the Creator, and then all the Torah and all the wisdom are in a person’s heart. It is very difficult for a person to agree internally that the road to the Creator goes through the love of others and that it is true that it is the same love, but in two different vessels. The others don’t exist, but it only seems to us that way so that we will have a chance to perform actions in order to expand our vessel. Later, it will be revealed that there is nothing but a person and the Creator. He corrected, fixed, and connected to himself the desires that he previously thought were the others, all the huge world that surrounds him. First, he found more and more connections in this world. He has seen that he is increasingly more connected and, eventually, he understands that this is all his vessel, and, thus, he connects to the Creator. So, “From the love of others to the love of the Creator” isn’t just a nice slogan, but the fulfillment of the desire, which is the only place where a person can reveal his upper world. This path is a result of the “shattering of the vessels” that took place especially in order to allow us to expand our feeling and, at the same time, to be independent and loyal to the Creator forever. “Love thy friend as thyself” is the great rule of the Torah, which includes the entire general desire in which all the Light is revealed. We can study it “on one foot” (in brief), which means that by just one action, we can acquire the whole attainment. We discover that behind what seems to us, like the others, there is the whole reality. The only problem is to perceive it internally. This is all our work, and, here, we need mutual guarantee since we can hear about it for many years before we even begin to get close to it. Then, a few more years are needed in order to decide to implement it. Thus, many years go by, and only mutual guarantee, mutual responsibility, pressure, envy, lust, and using all the means a person has, can help him become committed to and to internalize this principle as deeply as possible into his heart. We have to measure how deeply it enters us and brings us to internal agreement and by that to value our advancement. Question: You’ve said that being naive helps us greatly. At the same time, the study of Kabbalah expands our minds by a million degrees. How can we connect this contradiction? Answer: Naivety doesn’t consist of our becoming smarter and exceeding everyone else in our comprehension of the world, the universe, and the upper governance. In this regard, we are ahead of the world, but I’m not talking about this. By “naivety,” I mean straightforwardness. I’ve put a spiritual goal before myself and nothing can deter me from this path. I move forward, and this is the most important thing to me. I call the straightness of the path naivety. Opinion (Steen Jakobsen): “Steen Jakobsen, Chief Economist of Saxo Bank the online trading and investment specialist, stated that the human mind does not accept changes easily. My Comment: A crisis takes place in the mind. If humanity does not have enough willpower to accept the inadequacy of its nature for survival and to change itself, to make the agenda to implement integral education and training everywhere in order to achieve positive change—Nature, as usual, will make these changes on—and the extinction of suffering. Most important in resolving the crisis is the desire for change! Question: Among the “nations of the world” there is the category of AHP of Aliya (rising) that joins Israel first. Who are the people who belong to this category? Answer: Some join this process according to the order of correction and others are corrected only in the end. But in fact, it isn’t about human beings, but about vessels. It is not in kilograms of flesh and not in animal attributes, all this has nothing to do with spirituality. Another thing is important, and that is how big a person’s ego is and how deeply the point in the heart is buried. The only thing that a person has is his ego. So where is the spark (•) of future bestowal in him hiding? In which layers? On which of the five level of thickness (the thickness of the desire)? According to this a person awakens to correction. Basically, everyone has a point in the heart. After the shattering and the mixing of the vessels, there is even an initial part of it in the stony heart, since otherwise it will simply not be able to be corrected. 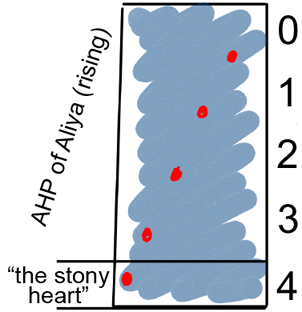 But if the fourth level is corrected only in the end, then all the other levels belong to AHP of Aliya. Our spiritual path is divided into two parts. The first part is rather difficult since we don’t exactly see what we are doing. But this is precisely what helps us renounce our egoism. If we could see what we are doing, then our egoism would participate in this process and only grow, and we would never be able to break away from it. So since we can only go forth with our eyes closed, that is, through separating from our egoism, gradually severing it from ourselves and transitioning to connection with the friends by exiting ourselves into the property of bestowal, then of course this is difficult for us. Our path is based on the fact that we draw the upper Light, which influences and corrects us. In other words, I am unable to correct myself, I cannot rise above my egoism, I can’t do anything with it at all, but I can draw the upper Light upon myself. Therefore, exertions in the wisdom of Kabbalah are very interesting and differ from exertions in our world where I directly affect an object, an area, or the properties that I wish to change: Here it is different. If I want to change something, then I have to draw the Light upon that object, that dimension, or those properties, so that the Light would change them. Thus, I’m constantly addressing only the Light so that it would change these properties. How does the Light know which properties to act on? It’s very simple. If I’m advancing toward the property of love, of mutual bestowal, toward the property of connection with the friends, if I’m trying to unite with them, then I discover that I’m an enormous egoist who wants to exploit them, who wants only personal gain, and who couldn’t care less about everyone else. When I discover this in myself and it evokes enormous suffering in me, then I begin to ask the Light to correct me. In revealing my inner egoism, I begin to turn to the Light and ask for it to change me. That is, I prepare an enormous uncorrected desire, reveal it in myself, and I feel how disgusting it is to me, how repulsive, how much I don’t want for it to exist inside me; it’s like a cancer that I want to cut out of myself—and then I turn to the Light so that it would perform this surgery on me. Thus, we have a very clear progression on our path: I’m moving all the time toward connection with the friends, towards the purpose of creation, the property of bestowal and love. I’m always moving towards exalting these properties, parameters, and definitions above myself, to make them my highest values. In the end, I reveal how opposite I am to that, how much I don’t want it, how artificial it all is in me, and so on. And then, from this bitterness, I cry out to the Light. So there’s a big problem here: People who aren’t capable of realizing this and who aren’t capable of suffering will not be able to go through this path. Moreover, the suffering is qualitative. A person feels it during normal life, even when everything is going really well for him. This is the suffering of love, when I would like to connect with the friends, when I know that it’s necessary, but I see that I can’t. Only this kind of suffering is meant here—no other! It’s not about whether or not I know the subject well, not that I’m a wise guy or say, impatient—no! The only thing that I need to reveal is my rejection of connection with others. Only this! Bestowal! When I’m repulsed by connection with others, when I suddenly begin to despise it, to not want it, this is precisely the property that I need to grab onto and to ask for its correction. This is the entire secret of Kabbalah. There is nothing else! Therefore, the first part of our path is a gradually increasing revelation of evil within us, and then, in a single moment it becomes corrected. This is why there are two phases to our advancement. The first phase is when throughout a few years we accumulate enormous, heavy, and lengthy suffering. And then, in a single moment it becomes corrected, and we open our eyes and see a completely new picture around us. It turns out that the entire creation functions in the property of bestowal and love: The entire world works this way, while to me in my egoistic properties it appeared that it was built on properties of egoism, conquering, violence, brutality, and so on. This is similar to how laboriously a rocket heads for its orbit in outer space, but afterwards, during orbit, in weightlessness, a calm suddenly sets in: Everything is quiet, the engines stop working, and you are out in space.